This attractive miniature greenhouse from Leisure Season is stylishly built using solid wood from the cypress family to produce a growing environment for plants to flourish in any season. The bottomless cabinet-like greenhouse includes three adjustable-height wooden shelves to situate seedlings and young plants and features a lift-up lid and dual front doors. At 30-inch W x 16-inch D x 43-inch H, it occupies minimal floor space but furnishes ample room to incubate young plants on a patio, balcony, porch or wherever garden space is limited. Palram Deluxe Nature Series greenhouses - Big enough for your dreams, small enough for your budget. Fill your spring and summer gardens with hundreds of mature colourful annuals that you've grown from seeds in your private greenhouse. You can grow everything from vegetables to delicate and exotic plants and winter delicate plants from your garden. Over the winter, you can store plants, tools and other items in the greenhouse open space. The Palram Deluxe Nature Series is a true hobbyist greenhouse with everything included. 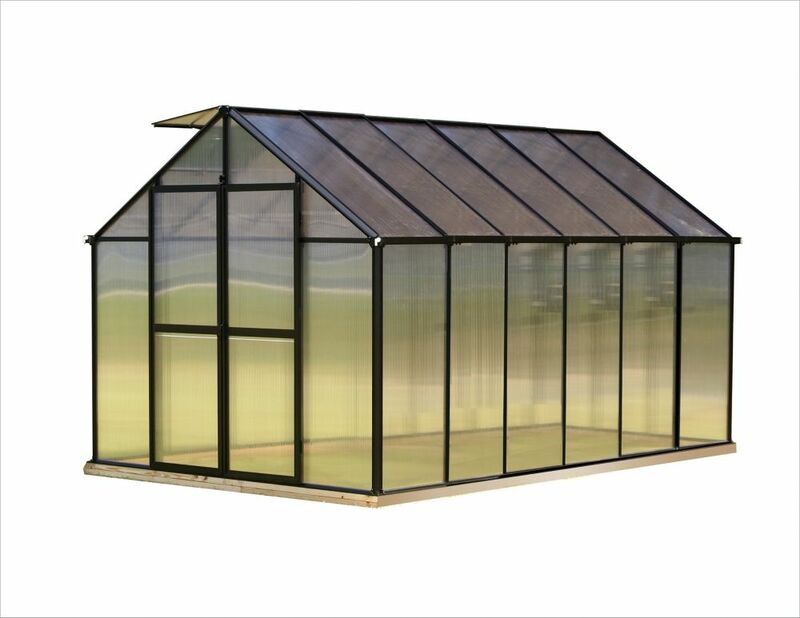 The Deluxe 12 ft x 12 ft XL Clear greenhouse is an extra wide and tall comfortable greenhouse. The interior space gives plenty of room for growing tall and leafy plants, as well as a leisure area. It has a wide and high entrance with lockable double doors. Includes 2 manual vents windows, and a threshold ramp for wheelbarrows or wheelchairs. 8 ft. X 12 ft. Black Greenhouse - Premium Package Not all greenhouses are built the same and the Monticello line of greenhouses by Riverstone Industries proves this to be true. Constructed from the highest quality extruded aluminum (US grade) and electrostatically painted Black (containing 0.0% lead), our greenhouse uses on average more than 40 lbs. more aluminum than the average imported greenhouse. Why is this important? The weaker the framework the less snow the greenhouse can hold in the winter time before collapsing and the easier it is to get damaged by the wind. While most hobby greenhouses use less expensive thinner walls and roofing materials, the Monticello uses professional grade 8mm twin wall polycarbonate. This acts as a double pain window keeping cooler air in during warm months and insulating the greenhouse from cold air in the wintertime; making the Monticello more efficient to grow in for a longer period of time and adds to the efficiency of growing. 8 ft. X 12 ft. Black Greenhouse - Premium Package is rated 4.7 out of 5 by 3. Rated 5 out of 5 by ChicoBoy from After reviewing many greenhouses, I felt this was the best, and I was not wrong. If six stars was... After reviewing many greenhouses, I felt this was the best, and I was not wrong. If six stars was possible I would give it six. It has been installed for about a week now. What I like is the quality of construction, the sturdiness once installed, the ease of installation, the interior height, and the extras that come with the premium greenhouse. But what I like the most is the level of service I received from Riverstone Industries the greenhouse manufacturer. My order originated with a third party. There was a mistake in the order made by the third party and Riverstone went to great lengths to help clear it up. I also talked with the greenhouse manager, who turned out to be the owner, and he gave me about 15 minutes instruction on the use of the greenhouse, which was very helpful as this is my first greenhouse. I am confident if I have any manufacturing difficulties they would be solved very quickly. Rated 4 out of 5 by Jerry from Green House Would be easy to setup secound time around. If you had add ons the directions left out additional steps within the instructions making you have to take apart to install. add ons were the sun shade and the benches. all an all it went ok and am well satisfied with the greenhouse and looking forward to getting started.